I love it when you can escape into a book and forget what’s going on around you. This book did that for me. I was so lost in Marina’s world of craziness that I didn’t notice what was happening in my world. Marina is such a great character. I loved the way everything in this one was told from her perspective. That makes it hard for the reader to know who they should trust. Because Marina had no idea who she could trust. I loved the whole premise of Marina, an 18 year old high school girl, winning a crazy amount of money. It makes the reader think, what would I have done with that much money at 18. I don’t know that I would have managed it any better than Marina does. I liked her family. Her parents are always pushing her to be the very best at everything. For Marina that ends up stifling. And it’s doubly bad when they are furious that she bought a lottery ticket to begin with. And even more furious that she’s going to keep the money. It’s a good thing she’s friends with the level-headed Darya. I liked her a lot. She gave really good advice, even though Marina rarely followed it. And she ends up in trouble in Marina’s place. I liked the way Marina grows throughout the story. At the beginning, she’s greedy. She wants the money, really for herself. She’s planning to use it to go to Julliard. But she quickly becomes enamored with the money and starts buying anything and everything she wants. Some of what she wants ends up being on credit. But by the end of the book, she’s learned a lot. She learns who she can and can’t trust. She learns that money isn’t everything. And she learns to watch her back and fight back when she has to. This is a great Young Adult book. I didn’t want to put it down! 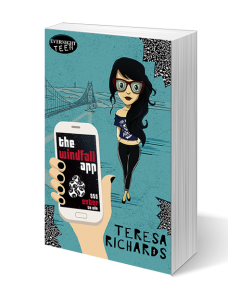 I was gifted an e-copy of The Windfall App by the author. All opinions are my own. 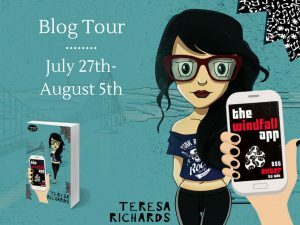 Teresa Richards, author of The Windfall App, is having a giveaway in conjunction with the release of the book. She’s giving away the pictured books. The winner, if located in the United States, will receive hard copies of the book. 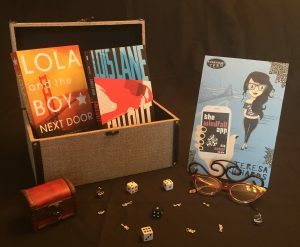 If and International winner is chosen, they will receive e-copies of the books pictured.